Russia’s “gas wars” with Ukraine and Belarus and pointed objections to Europe’s “third energy package,” as well as heated competition to develop rival and commercially dubious “southern” energy transit routes, have re-ignited concerns about pipeline politics across Eurasia. Typically, Western commentators and policymakers regard Russian-backed pipeline projects as tantamount to “steel umbilical chords” of dependence, ripe for commercial and strategic exploitation. Even champions of “resetting” relations with Russia caution against complacency, advocating multiple and transparent Eurasian pipelines to temper coercive inclinations over vulnerable downstream customers across Europe and Asia. Similarly, Russian officials and policy experts who trumpet both a new “business-oriented” foreign policy and “eastern vector” for energy exports complain that the volatile Eurasian energy transit landscape handicaps pragmatic pursuit of energy security to the detriment of Russian suppliers and their international customers alike. Arbitrary shifts in terms of transit for Russian energy, Western suspicions about Russia’s entry into the LNG market, as well as the push to construct the Nabucco gas pipeline – a project that would bypass Russia but that remains mired in controversy over sources of throughput and financing – feed Moscow’s anxiety over antagonistic “politicization” of Caspian energy exports. The angst surrounding these episodes is symptomatic of broader debate over the strategic dimensions to cross-border Eurasian energy transit in which pipelines are viewed as either instruments of competitive resource nationalism or conduits for strengthening interdependence and regional cooperation. This, in turn, betrays a conventional wisdom that politics and geostrategic posturing trump the economics of pipelines, rendering the “lands between” Russia/Caspian suppliers and markets in Europe and Asia as mere pawns in the global quest for energy security. Upon closer inspection, however, the Eurasian energy transit landscape is more enigmatic than commonly presumed. On the one hand, the NIS transit states exert considerably more influence over the volumes and terms associated with construction and operation of Eurasian pipelines than projected by relative power or supplier-customer dependency relationships. Moscow’s only mixed success at arbitrarily renegotiating favorable terms for tariffs, pricing, off-take, and/or debt-equity stakes, not to mention at securing political compromises from Ukraine (Orange and post-Orange regimes alike) and Belarus, is especially intriguing in this regard. On the other hand, there are fewer conflicts than predicted by the structure of pipeline economics and pure cost-benefit analysis. NIS transit states, in particular, have not been able to exploit uniformly classic “obsolescing bargains,” whereby sunk investments and fixed pipelines become increasingly vulnerable to discretionary revision by host governments. Here, the relatively smooth operation of oil (CPC) and gas (Blue Stream) pipelines involving Russia, as well as the Baku-Tbilisi-Ceyhan (BTC) oil pipeline stand out. This variable record of arbitrary disruption and renegotiation illuminates important conditions and practical lessons for advancing and sustaining future cross-border pipeline operations among Eurasian suppliers and transit states and downstream partners in Europe and Asia. Accordingly, Russian and international policymakers interested in engaging in alternative Eurasian transit deals would be best served by jettisoning simplistic notions of pipeline politics premised on either circumventing or embracing specific regional states. Instead, they should focus on “getting energy to market” by redressing conditions that accentuate adverse risk-taking or mar strategic bargaining associated with otherwise mutually beneficial pipeline projects. Export pipelines are subject to economies of scale, long-life cycles, large upfront investment, inflexibility, natural monopolies, and the tyranny of distance (especially for gas). The value of a pipeline, therefore, turns directly on the dedicated upstream supply, availability of substitutes, price of throughput, and state intervention. This requires contracts that stipulate property rights falling under different national legal jurisdictions and that distribute profits and rents among respective suppliers of throughput, owners of pipelines, host transit governments, and importers. Consequently, cross-border pipelines are fraught with structural challenges, as they involve multiple international stakeholders that are left to their own devices to resolve conflicts of interests, reconcile different national legal regimes, and locate mutually rewarding outcomes for the reliable delivery of valuable throughput. The underlying economic problems are compounded, as the owners of cross-border pipelines are not always the owners of the throughput or largest investors. In addition, the variable costs of operation tend to pale in comparison to the huge sunk costs of construction. Accordingly, there are economic incentives for delivery to continue in pursuit of revenue even if initial returns on investment are not recouped. These peculiarities create bargaining disparities, as the mobility and profitability of investment that initially empower owners become liabilities due to the long amortization of fixed pipelines and volatility in energy prices that, over time, encourage transit states to hold these resources hostage and to renegotiate for more favorable terms for tariffs and off-take. However, as noted by scholars such as Paul Stevens, the obsolescence of original contracts and shift in bargaining leverage towards the transit states can be mitigated under certain conditions: where the latter are more concerned about their international reputation, face competition from rival pipelines for the same throughput, and rely on the off-take to meet significant domestic needs. Thus, the conflict-prone structure of Eurasian cross-border energy pipelines is neither unique nor intrinsically unmanageable, as NIS transit states are not immune to the above conditions. What distinguishes contemporary cross-border energy transit in Eurasia, however, is that the economic fundamentals are significantly muddled by the Soviet legacy. As much of the existing regional pipeline infrastructure was bequeathed to the respective states of Eurasia, none of today’s stakeholders sunk hefty costs into construction. Therefore, when it comes to legacy pipelines, there is little concern with realizing returns on investment – otherwise a preoccupation with new pipelines. Instead, there are incentives to bargain for better terms, as suppliers and transit states risk incurring only opportunity and marginal costs of operation with disruption of delivery. This not only confounds the pure economics of obsolescing deals, but gives rise to more risk-prone and aggressive strategies pursued by Russian/Caspian suppliers, foreign operators, and NIS transit governments alike. When any one of the parties perceives both a likely threat to existing arrangements and even marginal prospects for significant gains from changing the terms of operation, arbitrary disruption can simply appear to be worth a gamble. The proliferation of “hybrid” regimes across Eurasia adds another confounding wrinkle. As captured by a recent wave of scholarship, Eurasia is marked by the emergence and sustainability of regimes that do not fit classic definitions of democratic or authoritarian polities. Rather, these regimes are distinguished by retaining more robust political contestation than associated with autocracies, but less procedural transparency and more uneven political playing fields than classic democracies. Specifically within this broad rubric, Russian and NIS regimes generally vary with respect to troublesome energy regulatory attributes related to weak institutional capacity; market concentration; insider- and patronage-based decision-making; blurred ownership and control over national energy resources and infrastructure; and the fusion of political and economic, as well as public and private interests in regulatory procedures. Although an understandable byproduct of divergent but protracted political transformation across the region, the checkered landscape of national regulatory opacity can accentuate information asymmetries among key suppliers and transit states surrounding preferred costs, tariffs, and revenue streams of respective pipelines. The institutional uncertainty complicates strategic bargaining. It muddles the capacity of national governments to reassure or otherwise convey their intentions to the other states and investors, undermining the credibility of respective international pipeline commitments. As noted by others, this can exacerbate the “bluffer’s dilemma,” whereby the foreign influence of a government declines as its reputation as a bluffer grows. Ironically, this places greater reliance on contract stability (as opposed to the rule of law) as the indicator of credible commitments, at the same time that it increases legal and regulatory risks and generates parochial incentives to renege on the original terms for operating respective pipelines. Therefore, the economic motives and signals that otherwise govern strategic interaction for cross-border transit founder amid hybrid national regulatory institutions that are too shrouded and frail to allay anxieties or to resist impulses to renegotiate arbitrarily for more favorable terms. This makes it especially difficult to project the cost effectiveness of sustaining versus disrupting the operation of energy export ventures among Eurasian suppliers, pipeline owners, and NIS transit states. In sum, the bargaining context surrounding Eurasian pipeline operations varies, affected not only by different financial considerations surrounding “old” versus “new” cross-border transit infrastructure but by divergent national capacities to extend international credible commitments. In particular, bargaining over Soviet legacy pipelines among supplier or transit states characterized by uncertain fiscal and regulatory institutions can simply doom otherwise mutually beneficial pipeline ventures. Here, commercial incentives for managing energy export relations are confounded by asymmetries in the relative value (economic and political) assigned to specific transit options, divergent risk-taking propensities, and institutional opacity among key Eurasian energy supplier and transit states. These conditions make it especially hard for all parties to resist gambling on disruption of cross-border transit deals or to communicate resolve at upholding equitable contract terms. Consequently, commercial spats can readily (and inadvertently) escalate into costly bouts of strategic confrontation. Together these economic and institutional factors shape relative bargaining leverage among the involved parties that, depending on the specific combination, increase or decrease the likelihood for successful operation of Eurasian pipeline projects. The record of Eurasian pipeline politics has been conspicuously mixed. There have been dramatic episodes of gas and oil cut-offs orchestrated by suppliers, most notably Russia. Similarly, NIS transit states – such as Ukraine and Belarus – have instigated and prolonged showdowns by unilaterally revising terms for tariffs and off-take – at the expense of both Russian suppliers and European customers. Much less noticed, several potential cross-border transit crises have been averted. These events and “non events” illustrate not so much that specific states are to blame for disrupting Eurasian energy transit, but that bargaining power and credibility turn on the balance of key financial and institutional conditions. The most conspicuous episodes of Eurasian pipeline politics have involved successive gas showdowns between Russia and Ukraine. They constitute the only cases where significant supplies to downstream European markets (80% of Russia’s gas exports!) were disrupted. Although Russia precipitously raised the price, altered the terms for Ukraine’s off-take and role of intermediaries, and subsequently diminished the volume of supply to compel compliance, both cut-offs were costly to Russian suppliers in monetary and reputational terms, and resulted from very different bargaining conditions. In 2006, for example, Russia’s Gazprom was well motivated and positioned to blackmail Kiev, given rising European and Central Asian gas prices (that significantly raised the costs of subsidies and non-payments), and its success at foreclosing independent deliveries from Turkmenistan. At the same time, the newly minted “Orange” leadership was consumed with consolidating domestic power and gradually diversifying energy supply relations. Notwithstanding its leverage, Moscow’s concerns about preserving the security of deliveries to lucrative and nervous European markets, and its reputation as a reliable supplier, rendered it especially sensitive to even marginal knock-on effects of Ukrainian diversions of throughput. Furthermore, the diffusion of imprecise, incomplete, and opaque regulatory authority among a m?lange of state entities and political insiders, Gazprom and unaffiliated Russian gas traders, private Ukrainian gas distributors, and Central Asian exporters created the cover for unrestricted opportunism and rampant confusion. This constellation of factors encouraged mutual risk-taking, at the same time that it tempered Russia’s ability to resolve the price issue, dictate transit fees, or impose political demands on Kiev. The situation in 2009 was quite different. Moscow’s bargaining position appreciably deteriorated, as it was locked into paying for expensive Central Asian supplies as world prices, domestic production, and downstream European demand were falling. Any disruption in delivery was financially painful ($100 million per day), and in the wake of the European outcry from 2006, was especially damaging to Russia’s claim as a reliable supplier. Accordingly, Russia was impotent to extract supply and transit prices from Kiev that were significantly more favorable than what it had achieved months before it punitively turned off the spigot. By contrast, Ukraine was in a better position to hold Russia’s cross-border exports hostage, as Gazprom could ill-afford a default on accumulated debts and because Kiev had hoarded earlier Russian supply that it could re-route to domestic customers in a pinch. With declining consumption and exploration of alternative supply routes in Europe, Kiev also was motivated (augmented by the promise of domestic reform) to press the EU for investments to rebuild its pipeline and storage systems; it could raise the specter of disruption with little risk of fundamentally alienating Europe. Moreover, Ukrainian politicians became increasingly risk-prone in the face of heated political crises, a sinking economy, and deteriorating terms of trade. That Russian intermediaries were intimately tied to “dark forces” within Ukrainian political and energy circles compounded problems with sending clear signals about acceptable outcomes, and with establishing responsibilities for collecting and paying energy debts. Amid this convoluted landscape, none of the parties involved could extend credible commitments to sustain mutually acceptable deliveries or avert costly escalation of the crisis. Moscow’s brief shut-off of crude oil deliveries to Europe via the pipeline across Belarus in 2007 also resulted from mutual frustration and a yawning bargaining gap. Moscow’s tolerance for subsidizing imports waned, with rising international oil prices, proposed construction of the competing second line of the Baltic Pipeline System, and fatigue with Minsk’s failure to implement reforms for the planned union and greater access for Russian firms. Russia’s pipeline monopoly enjoyed considerable room to impose higher export duties and to curb Belarus’ re-exports of Russian oil, as downstream European customers had alternative suppliers and maintained a two-month strategic reserve to cushion the blow of a short-term disruption. There also were strong incentives to reset NIS oil relations, especially in the wake of rows with Azerbaijan, Georgia, and Ukraine, not to mention earlier success with doubling gas prices and wrestling 50% control over Belarus’ domestic gas pipelines. By contrast, Belarus had only a one-week’s worth of reserves, and could not turn to alternative suppliers or allies. Moreover, the leadership in Minsk depended on the off-take to meet domestic consumption, and earned over $2 billion from the processing and re-export of cheap Russian oil. The latter, in particular, was critical for maintaining arbitrary economic and political power and sapping inclinations among key security and business elites from endorsing any viable political opposition. As Moscow ratcheted up demands, therefore, it effectively over-played its hand. It presented Minsk with seemingly dire domestic consequences and the near certain loss of its treasured “economic sovereignty,” thereby enhancing the appeal of risks associated with stealing oil and blackmailing Russia. In stark contrast, newly constructed post-Soviet-constructed pipelines have experienced far fewer arbitrary disruptions. 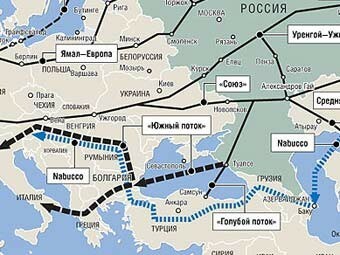 Notwithstanding the nuisance of occasional technical glitches or physical attacks on the pipeline, the BTC route for delivering Azeri crude to European markets via Georgia and Turkey has been insulated to date from discretionary renegotiation. While a number of factors augured well for the costly pipelines to be built (e.g. committed private champion, convergent NIS political interests, third party support), the initial bargains have held largely due to the fact that the stakes for maintaining smooth operations are especially high for Georgia. Specifically, the project is part of a potentially expanding network of Caspian cross-border pipelines, transit revenues are paid with delivery of total throughput, and Tbilisi depends on Azerbaijan for critical supplies of gas and oil. With prospects for landing future deals for energy transit (especially the Azerbaijan, Georgia, Romania Interconnector-AGRI) and for upgrading its oil export terminals – not to mention open tensions with Moscow and de facto independence of Abkhazia and South Ossetia – even a risky leadership in Tbilisi has little to gain from extorting the operators and accentuating discord with U.S. and West European governments. Furthermore, clearly delineated state and foreign company rights within the Azeri regulatory system, and an agreed dispute resolution mechanism that empowers the U.S. as referee, have combined to buttress the credibility of respective commitments to uphold the success of the venture. To be sure, there are success stories involving Russian participation. The CPC project, the only pipeline in Russia not wholly owned by the state transit monopoly (Transneft) and that delivers Kazakh crude to markets in Europe, has kept the oil flowing and remains on track to expand by 2013. Moscow’s threats to hike taxes and transit fees, overhaul terms of payment and financing, restructure the consortium’s management, and hold up the planned expansion in a play to acquire a controlling stake ultimately proved hollow. Critical to the ongoing success have been the stipulated phased expansion, designation of oil producers in the supplying Kazakh fields, including Russia’s Lukoil, as full joint partners in the CPC; options for transiting Russian oil in an expanded pipeline; and agreement by all parties – including the private companies and the Russian and Kazakh governments – to international arbitration on equal terms. Both the prospects for alternative transit of Kazakh crude via the BTC or to China, as well as the ongoing rivalry between conflicted Russian oil firms and Transneft, have attenuated threats of resource nationalism and inflated the opportunity costs of blocking the CPC’s expansion. By the same token, Russia has reliably delivered gas to Turkey for re-export to markets in Europe and the Middle East. Although initial negotiations were marred by informal dealings, the gas trade between respective parties has become increasingly transparent. The Blue Stream project, in particular, has benefited from Ankara’s status as the largest single consumer of Russian gas (with demand expected to rise after 2015) and expanding visions of becoming a global transit hub. In conjunction with the lobbying for separate follow on projects and bilateral deals – by Moscow, European officials, and private investors – these factors have effectively raised the stakes for continuing smooth operations. Notwithstanding mutual gamesmanship over preferred pipeline routes, export volumes and transit fees between Russian and Turkish officials and energy firms, the issues above bode well for eventually upholding Turkish transit arrangements for Russian gas and oil throughput currently under consideration. Not all Eurasian pipelines are created equal. Because of the peculiarities associated with Soviet legacy pipelines, and the huge start-up of costs of investment in new fixed transit routes, the costs – economic, political and reputational – of arbitrary disruptions to future ventures will likely be more severe than suggested by showdowns over inherited pipelines for all parties involved. Accordingly, statesmen should avoid basing the pursuit of new ventures on the drama of recent Russian-Ukrainian showdowns. Future routes, once up and running, are less likely to entice aggressive risk-taking. By the same token, policymakers must appreciate that lingering disputes between Moscow and Minsk and Moscow and Kiev over terms of pricing, transit, and off-take betray the perverse political economy of legacy pipelines more than the political leanings of respective leaderships. Diversification trumps specific pipelines. The mixed bag of energy export reveals not only that state intervention is a must, but that all of the governments in Eurasia (including Russia) can play both constructive and disruptive roles in cross-border transit. The advantages of competition among alternatives for containing opportunism should not be sacrificed either in favor of specific projects or to isolate specific states. In this respect, policymakers in Washington, Brussels, and other European capitals should not rush to judgment concerning both the political expediency of constructing the Nabucco pipeline. Similarly, Moscow would be wise to allow commercial considerations to trump political impulses in promoting alternative variants of South Stream and Blue Stream II projects. Policymakers on all sides should promote general “directions” for diversifying Eurasian energy transit – e.g. the “Southern Corridor” – and for mediating future disputes, leaving it to the parties involved to determine the selection, sources of throughput, cost effectiveness, and contract terms for specific pipeline ventures. Reassurance is critical to pipeline diplomacy. Risk-prone Eurasian leaderships must be reassured and not driven to take gambles on arbitrary disruption that are costly for all. Consequently, American and European “multi-partner” diplomacy should be aimed at either attenuating the political risks or increasing the upside of smooth operations of alternative pipeline projects. This can be best realized by tying future investment in transit state energy infrastructure, phased pipeline extension, and development projects to successful delivery of throughput. By the same token, Russia should shun complicated arrangements that link discounted energy exports to political and military concessions by transit or customer states, as broached with Ukraine, Belarus, and Moldova. Without solving for problems posed by legacy pipelines and hybrid regimes, or ensuring that those who pay the costs (Russian oil or gas firms, downstream consumers) reap the benefits (military and political insiders across these countries), these discretionary pipeline deals invite brinkmanship and chronic risk-taking that doom them to unravel at the expense of all parties. Promoting institutional transparency. Relative bargaining power matters so much in Eurasia because the risks, credibility and capacity engendered by opaque domestic regulatory systems are so weak. This places added pressure on clearly specifying contract terms and responsibilities, fusing the stakes of suppliers and transit-state in cross-border pipeline ownership, and actively engaging in international conflict resolution procedures. Over time, greater attention should be devoted to encouraging transparency in domestic regulatory systems and oversight mechanisms, as opposed to pushing adherence to international charters, as the former are key to upholding self-enforcing cross-transit agreements and exposing hostile intentions. Accordingly, success at realizing a successful southern gas pipeline route – be it South Stream, Nabucco or the AGRI – will depend as much on undertaking pointed reforms that can effectively illuminate the interests and credibility of future national stakeholders to live up their agreements down the road, as on identifying financing and dedicated throughput du jour. Adam N. Stulberg is an associate professor and co-director of the Center for International Strategy, Technology and Policy of the Sam Nunn School of International Affairs, Georgia Institute of Technology.